This book takes the viewpoint that plain symbol processing techniques have little hope of reproducing the depth and breadth of capabilities found in human beings. The book introduces new foundational principles to AI: connectionist/neural networking methods, case based and memory based methods and picture processing. The book looks at methods of AI as different ways of doing pattern recognition. One way to do pattern recognition is to compare a problem to stored cases. At the other end of the spectrum, Classical Symbol Processing AI compresses cases down to a small set of rules and then works only with this condensed knowledge. In between these two extremes are neural networks, especially backprop type networks. As much as possible the book compares these three basic methods using actual AI programs. The structure of the book starts at the bottom of human abilities with vision and other simple pattern recognition abilities and moves on to the higher levels of problem solving and game playing and finally to the level of natural language and understanding of the world. At the higher levels more complex computer architectures are needed that include methods for structuring thoughts. The book is organized in a manner in which the reader will get an intuitive feeling for the principles of AI. Throughout the book applications of basic principles are demonstrated by examining some classic AI programs in detail. The book can serve as a text for juniors, seniors and first year graduate students in Computer Science or Psychology and includes sample problems and data for exercises and a list of frequently asked questions. 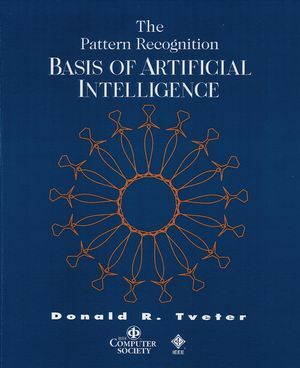 Donald Tveter is the author of The Pattern Recognition Basis of Artificial Intelligence, published by Wiley. 1.1.3 The Turing Test for Thinking. 1.1.4 The Chinese Room Argument. 1.1.5 Consciousness and Quantum Mechanics. 1.6 The Problems with AI. 1.8 The Organization of the Book. 2.1 A Simple Pattern Recognition Algorithm. 2.2 A Short Description of the Neocognitron. 2.4 Expanding the Pattern Recognition Hierarchy. 3.1 Mathematics, Pattern Recognition, and the Linear Pattern Classifier. 3.1.1 The Linear Pattern Classifier. 3.2 Separating Nonlinearly Separable Classes. 3.2.1 The Nearest Neighbor Algorithm. 3.2.2 Learning Vector Quantization Methods. 3.3.6 Comparison with Human Thinking. 3.4.5 Dealing with Local Minima. 3.4.6 Using Back-Propagation to Train Hopfield/Boltzman Networks. 3.5 Pattern Recognition and Curve Fitting. 3.5.1 Pattern Recognition as Curve Fitting. 3.6 Associative Memory and Generalization. 3.6.2 Local and Distributed Representations. 3.6.3 Reasoning within a Network. 3.7.2 Reading Text. 3.7.3 Speech Recognition. 4.3 Rules and Basic Rule Interpretation Methods. 4.3.1 A Small Rule-Based System. 4.5 More Sophisticated Rule Interpretation. 4.5.1 Dealing with Incomplete Data by Asking Questions. 4.5.4 Extra Facilities for Rule Interpreters. 4.6 The Famous Expert Systems. 4.7 Learning Rules in SOAR. 4.7.2 The Power Law of Practice. 5.1 Standard Form and Clausal Form. 5.3.1 The Problem with Blind Searching. 5.4 An Example Using Otter. 5.5 The Usefulness of Predicate Calculus. 6.1 The Basic Human Architecture. 6.3 The Virtual Symbol Processing Machine Proposal. 6.4 Mental Representation and Computer Representation. 6.4.1 A Problem with Symbolic Representation. 6.4.2 Symbol Grounding as a Solution. 6.4.3 Structure and Operations on Structures. 7.1.2 Arguments Against Condensed Knowledge. 7.1.3 Problems with Condensed Representations. 7.2.3 A HERBIE Solution to Reading. 7.3.1 Case-Based Reasoning in People. 8 Problem Solving and Heuristic Search. 8.1.1 The Blind Search Methods. 8.2 A Geometry Theorem Prover. 8.3 Symbolic Integration and Heuristic Search. 8.3.2 A Symbolic Program to Learn Integration. 8.3.3 A Partial Back-Propagation Solution. 9.1 General Game Playing Techniques. 9.1.2 More Sophisticated Searching Methods. 9.3.3 A Second Back-Propagation Approach. 10.2 The Transition Network Grammar. 10.2.1 A Simple Transition Network. 10.2.4 Syntax is not Enough. 10.4 Scripts and Short Stories. 10.6 Defining Words by the Way they are Used. 10.7 A Recurrent Network for Sentences. 10.9 Learning the Past Tense of Verbs. 10.9.2 The Rumelhart and McClelland Network. 10.9.3 The Classical Rule-Based Model. 10.10 Other Positions on Language. A.1 A Derivation of Back-Propagation. A.1.2 The Generalized Delta Rule, or Back-Propagation.